PXSTL, a design-build competition organized by Pulitzer Arts Foundation and the Sam Fox School of Design & Visual Arts at Washington University in St. Louis, explores how temporary interventions can spur long-term urban revitalization, and provides the public with an outdoor space for cultural activity in the heart of the Grand Center neighborhood of St. Louis. 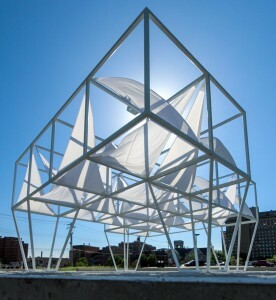 The winning design, Lots by Freecell Architecture, is a temporary construction composed of a platform, canopy, and fabric sails. Since its opening in May, PXSTL serves as a space for outdoor performances, social gatherings, and public education programs. As part of MD / STL, several programs will take place at PXSTL including; The Moth Project by PlantBot Genetics ; 30 Days of Demolition by Preservation Research Office and artist Carlie Trosclair, and Zero: A Landscape of Conservation and Action by anthropologist Adrián Cerezo, photographer Carly Ann Hilo, and artist Catherine Leberg. 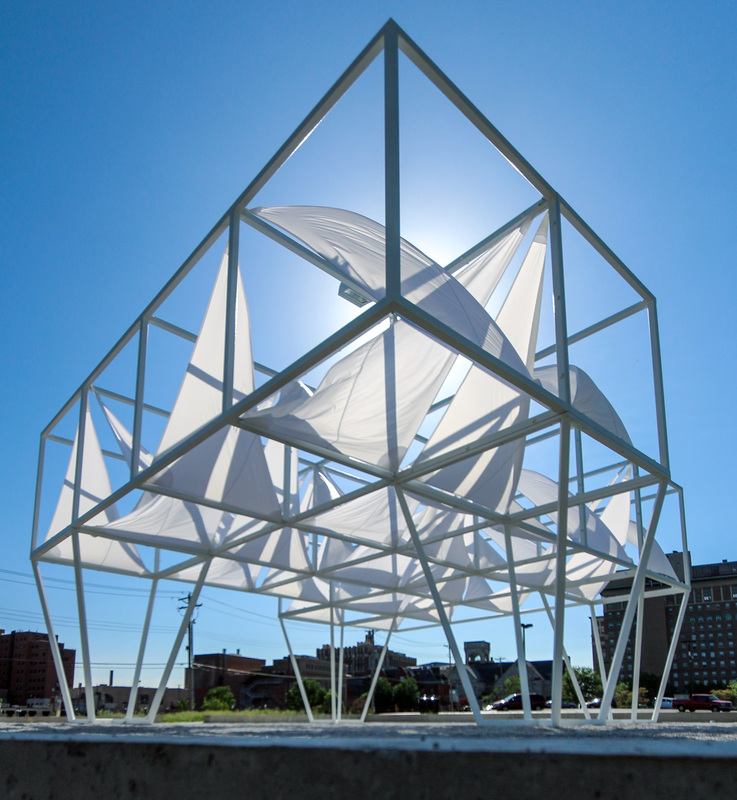 These projects expand upon the PXSTL theme of community engagement by exploring how collaboration between art, science, and the St. Louis community can impact broader community issues such as climate change. Beginning Wednesday, July 30 through Friday, August 1, PlantBot Genetics will transform the PXSTL site with The Moth Project; an interactive installation focused on the role of insects in our environment and exploring the possibility of moths as pollinators. 30 Days of Demolition will examine urban demolition in St. Louis over the past 30 days through a map-like installation at the PXSTL site by artist Carlie Trosclair and a lecture by Michael Allen of the Preservation Research Office. The installation will be on view from 9 am – 5 pm on Saturday, August 2, and the lecture will take place at Pulitzer Arts Foundation at 1 pm. Zero: A Landscape of Conservation will encourage MD/STL guests and participants to recap the series through a discussion and community potluck on Sunday, August 3, from 11 am – 3 pm. The platform for the discussion includes issues of comprehensive sustainability addressed through Marfa Dialogues and artist Catherine Leberg’s installation 1,000 Cups, which will be on view outside the Pulitzer entrance, Friday, August 1, through Sunday, August 3.